As owners of a fun and busy quilt shop we thought you might like to know a little about us. We had talked about opening a quilt shop over the years and many times we asked each other "Wouldn't it be fun to have a quilt shop?" We have been friends for over 20 years and busy with our kids and jobs, but the dream was still there. 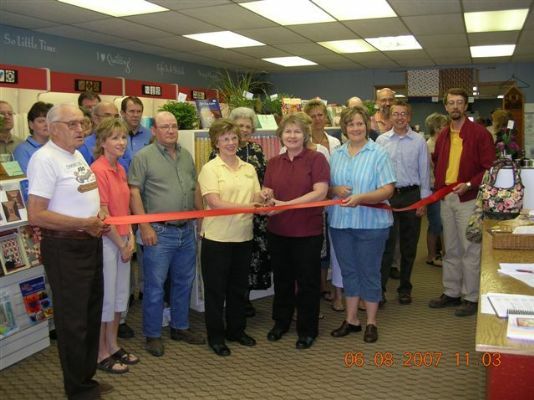 We knew if we were going to open a quilt shop we needed to do it soon as we weren't getting any younger :) Three years prior to the quilt shop Kim started a long-arm quilting business out of her home which was keeping her very busy. After doing a lot of research and coming up with a business plan, Kim thought Cherokee could benefit from having a full service quilt shop in town. It would be the only quilt shop in Cherokee County. Still, it was a risk and she questioned the idea. After telling Ginny her apprehension, Ginny offered her assistance and a partnership was developed in January 2007. This way any stress, along with the adventure, would be split in half. As it turns out, we are having a very good time after being open for over a year. Our goal is to have fun with this and make the customer have just as much fun when they walk into the Quilt'n Kaboodle. We have several part time employees who offer their expertise and are always welcome to help with any project that a person might be struggling with. The next time you are in the area be sure to stop in to Quilt'n Kaboodle and see what's happening.